Action from the 2017 Burghley Sixes. Holders Oundle Town will start their defence of the Burghley Park sixes title with a game against Empingham. The draw for the popular event was made yesterday (June 23) and as tradition dictates the holders open the competition on Monday July 2 (from 6pm). Teams line up in front of the historic Burghley Ppark pavilion. Burghley Park cricket week runs from July 2 to July 6 with all-day friendlies followed by competitive sixes action. 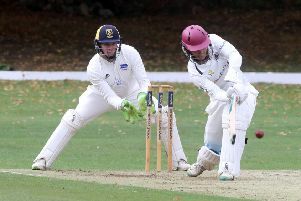 Sixes draw: Oundle v Empingham, Market Deeping v Barnack, Keton Sports v Burghley Park, Nassington v Bourne, Uppingham v Market Overton, Castor v Oakham, Ufford Park v Stamford Town, Uffington v Newborough. The semi-final and final take place on Friday, July 6. The all-day games see Burghley Park take on: July 2 ECB Staff XI, July 3 Authors XI, July 4 Gentlemen of Lincolnshire, July 5 Gentlemen of West Norfolk and July 6 the MCC. All matches start at 11am. The Burghley Park cricket week logo. The BGL Group are the title sponsors this year. A beer tent and food are available all day every day.